PHUKET: Rescue workers used fruit as bait to catch a wild pig-tailed macaque that was running amok in Pa Khlok yesterday (Jan 11). 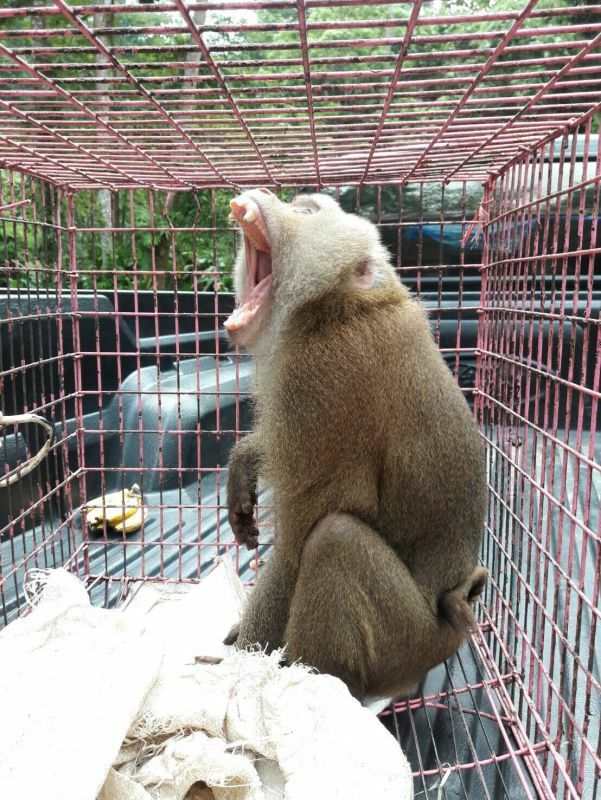 Kusoldham rescue workers were informed by locals at 2:30pm yesterday that a large pig-tailed macaque was running around Pa Khlok causing alarm to a number of residents. Rescue workers went to the scene and using fruit as bait lured the animal into a cage. 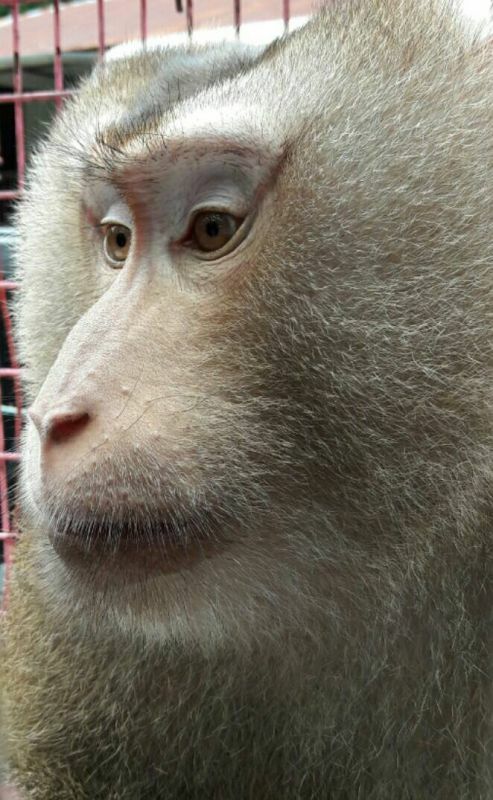 Once trapped inside rescue workers transported the macaque to the Khao Phra Thaew Non-Hunting Area in Thalang. 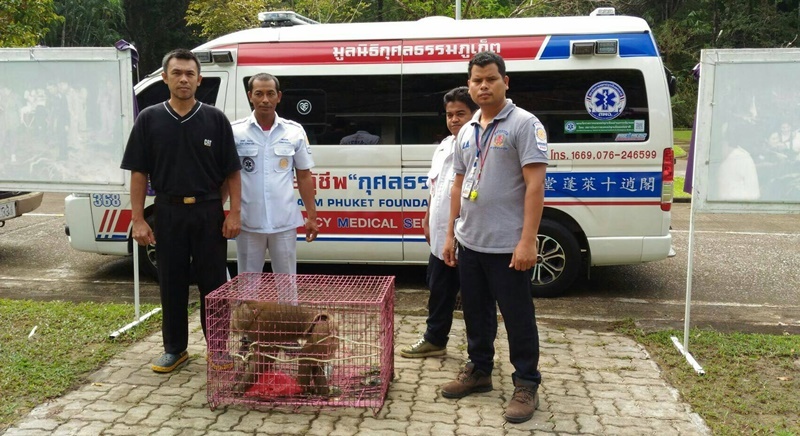 Mr Pongchart Chouehorm, Director of the Khao Phra Thaew Non-Hunting Area received the monkey from rescue workers before sending it on to the Phang Nga Wildlife Nursery Station. Mr Pongchart said, “Monkeys often come out and bother local residents. This happens in some parts of the island because what used to be the animals natural habitat has been turned into urban areas. “This change in environment leaves them with limited food sources so they come out looking for alternatives in community areas,” he said. “If anyone seen any monkeys come into residential areas they should inform rescue teams or us. Please do not hurt the animals because this could lead to legal action,” he added.